SHED NO TEARS for the "millionaires tax" ballot initiative, which the Massachusetts Supreme Judicial Court struck down on Monday. From the outset, the initiative was a cynical ploy to get voters to do something they have repeatedly rejected — replacing the state's flat-rate income tax with a system of graduated tax brackets. But nobody was fooled by the ruse, least of all the SJC. 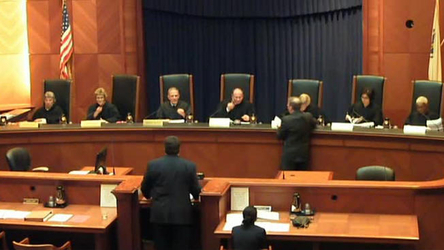 In a 5-2 decision, the Bay State's highest court struck down a proposed "millionaires tax" ballot question. Five times in five decades, Massachusetts voters have been asked to scrap the uniform tax rate required by the state's constitution. Five times they have refused. So activists this time came up with a two-fer: They proposed a "Fair Share Amendment" that would not only whack anyone earning more than $1 million with an 80 percent income-tax surcharge, but would also earmark the money raised for two popular purposes — public education and public transportation. On both counts, the two-fer was illegal. Article 48 of the Massachusetts Constitution allows private citizens to initiate ballot questions, but there are conditions: An initiative's provisions (1) must be so plainly "related or . . . mutually dependent" that they embody a single purpose, and (2) earmarking — a "specific appropriation of money from the treasury" — is disallowed. The proposed amendment met neither condition. Its provisions were obviously not closely related (public education has no inherent link to public transportation, and neither is connected to taxing the wealthy). And by specifying how the surtax revenue would be spent, the Fair Share Amendment was an exercise in blatant earmarking. The rules for ballot questions have been in effect for 100 years. The millionaires tax initiative violated those rules, and it was Attorney General Maura Healey's obligation to say so. Instead, abdicating her duty, she certified the initiative for submission to the voters. It was not her finest hour. Now the Supreme Judicial Court has cleaned up Healey's mess. In a 5-2 decision, it ruled that the proposed initiative, by jumbling together unrelated elements, was disqualified for the ballot. "It would be unfair to place voters in the untenable position of casting a single vote on two dissimilar subjects," the court held. Reasonable people can disagree on the merits of a flat-rate vs. graduated income tax, on the wisdom of a millionaires surtax, and on how much the state should spend on education or the repair of roads and bridges. All are perfectly legitimate subjects for political debate; the court, quite correctly, didn't weigh in on any of them. But while the justices may be nonpolitical, they aren't deaf and dumb. The SJC didn't just fall off the turnip truck. And its opinion makes clear that it understood perfectly well what the progressive coalition behind the Fair Share Amendment had hoped to pull off. 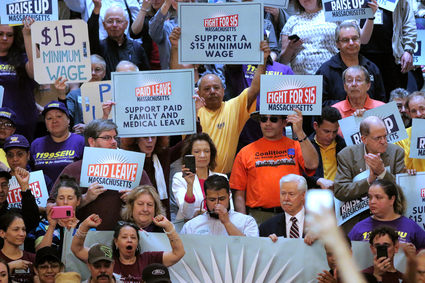 Left-wing Massachusetts activists, keen to raise taxes on the wealthy, figured the state constitution's rules didn't apply to them. Now they know better. "We are not entirely unaware of the possibility" that the amendment was purposely drafted "to 'sweeten the pot' for voters," the majority remarked dryly. Knowing that every previous attempt to permit graduated tax rates had failed, activists this time around hoped to tempt voters with the prospect of more money for favored causes — and with a dash of eat-the-rich class envy thrown in for good measure. The SJC doesn't actually say that, of course. Instead it quotes someone who did: former Senate President Stanley Rosenberg. "In the past, constitutional amendments have been very differently constructed," Rosenberg explained when he endorsed the initiative. "This one, because it is focused specifically on money for education and transportation, will stand a better chance of being approved. And also because it is very clear that it [affects] people who make more than $1 million." It was just that kind of cynical "wheedling and deceiving," wrote the majority in spiking the proposed amendment, that Article 48 was designed to block. The place for jury-rigged legislation that cobbles together widely disparate provisions is the Legislature, not in initiative petitions placed before the voters. A ballot question isn't a wish list. It must present a unified and coherent statement of public policy. The millionaires tax missed the mark by a mile, and the SJC gave it what it deserved.